My name is Goran Utvic I am a licensed Real Estate Broker in Illinois. This is a quick video showing how I am able to sell houses fast in Chicago. 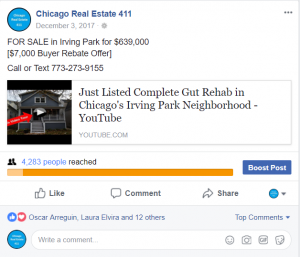 Advertising on youtube and facebook together with coming soon listings and generating a ton of viewers to get the maximum amount of exposure to homes I sell in the Chicago area. Call or text me at (773) 273-9155 to sell house fast Chicago and for the best price. 3731 North Drake Avenue in Chicago. This property was listed on November 29th and we got it under contract December 22nd just before Christmas. You can see here the listing time was 24 days we had this property listed at $639,000 and sold it for $615,000. Again this is in Chicago’s Irving Park neighborhood. I just want to show a little bit here how we’re able to get properties like this sold fairly quickly and the advertising that we do to get this done. This is our Facebook page when the property was coming soon before it hit the market what we do is we did a video like this one here it was a coming soon video saying here if you’re looking to buy a house in Chicago. Here’s a sneak peak of this property you can see that we had here 14,220, 14,420 people reached. 6,000 views of the video that generated a lot of traffic a lot of phone calls before the house was even listed on the MLS and then once we had it listed on the MLS we had it again posted on December third here you can see with the YouTube video I’ll show you that YouTube video as well here we had 4,283 people reached and here is the Facebook I’m sorry in a YouTube video you could also see had 474 views. 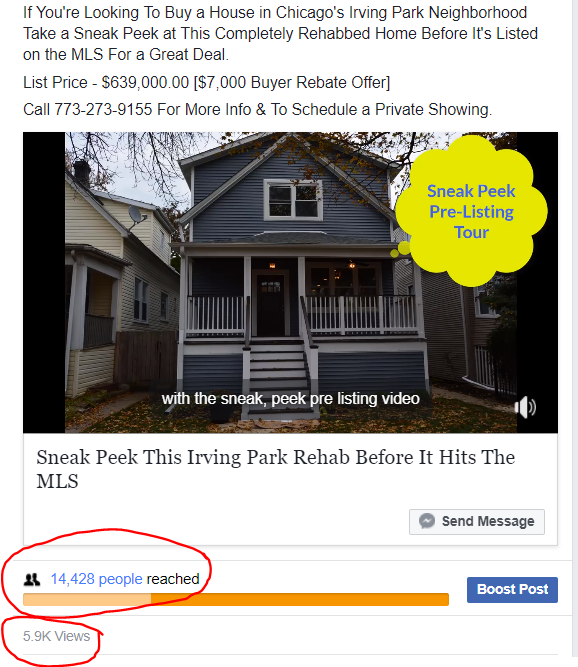 Facebook and YouTube together combined together with coming soon advertising, coming soon is very popular right now as well as Facebook live videos…there’s a lot of use for it we get a lot of traction this sets up the stage for getting it on the MLS. You get the word out and then it gives us huge, huge amount of traffic with showings and getting properties sold fairly quick. I’d be happy to come out take a look at your property and give you an idea of what it could sell for and in what time frame we could sell it. Just go ahead and call me at that number or text me at (773) 273-9155 could I ask you for a huge favor if you like these videos please subscribe to our Channel right here and then after that go ahead and check out our Chicago real estate deals playlist.